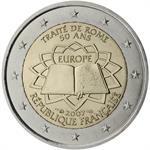 Home > flora & fauna > birds > 2015 France €2 Coin Issue "Peace in Europe 70 Years"
The first 2 euro coin from Monnaie de Paris in 2015 celebrates 70 Years of Peace in Europe. The reverse features a stylized image of a dove carrying a branch as a symbol of peace, tracing back to the story of Noah’s ark. 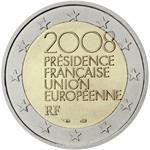 In this depiction, the leaves on the branch of have been replaced by twelve stars, representing the twelve stars on the European Union flag. 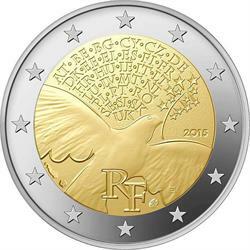 Above the dove are the two-letter symbols for the countries of Europe. 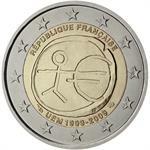 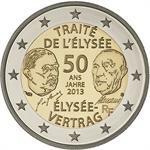 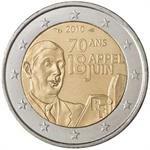 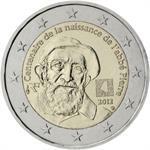 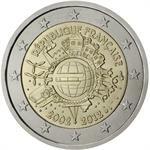 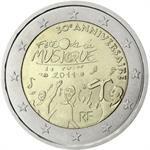 The commemorative coin's reverse is identical to that of ordinary €2 circulation coins.